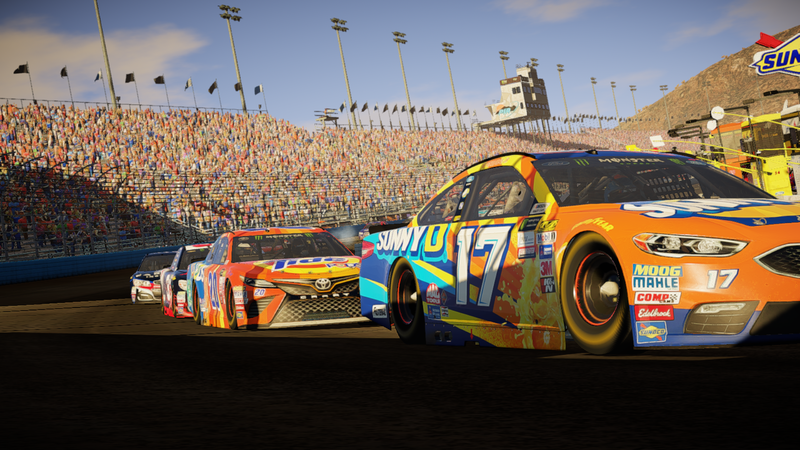 Chalk it up to being a new game built from the ground up, but 2016’s NASCAR Heat Evolution felt more like a proof of concept than a real game. While the gameplay was okay, the presentation and feature set were as bare bones as could be and the overall package was pretty disappointing. Fast forward to 2017 and Monster Games and 704Games’ (formerly Dusenberry Martin Racing) second current-gen NASCAR game is upon us with some much needed improvements. There are definitely still some rough edges and some missing features, but NASCAR Heat 2 is easily the best NASCAR game we’ve had in quite a while. See our full review for all of the details. 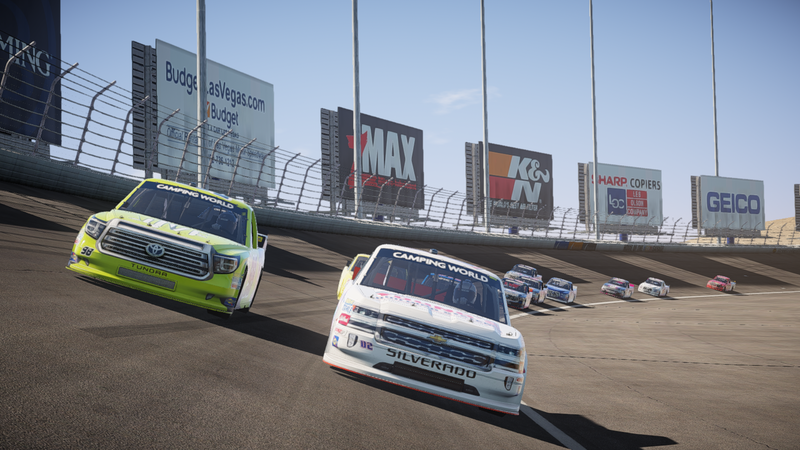 Probably the most significant new feature in NASCAR Heat 2 is the return of the Craftsman Trucks and XFINITY national series in addition to the top-tier Monster Energy Cup Series. This is the first time since NASCAR 09 from EA Sports that all three national series have been featured in a game, so it’s kind of a big deal. Having all three series means a much larger roster of real drivers and teams, but also the addition of six new tracks such as Road America, Iowa Speedway, and the Eldora dirt track, among others, that the Monster Energy Cup Series doesn’t visit but the lower-tier series do. This all adds up to a huge number of real drivers, real teams, and real tracks to make NASCAR Heat 2 the most authentic NASCAR game we’ve had in years. Gameplay modes include Quick Race, Challenges where you match real accomplishments from real drivers, and a Championship mode where you choose a series and try to win a title, along with full online multiplayer as well as splitscreen local multiplayer. And, of course, the main single-player mode is the Career mode. Also worth noting is that all of the tracks are unlocked from the start this time around unlike last year’s game that bizarrely made you unlock stuff. 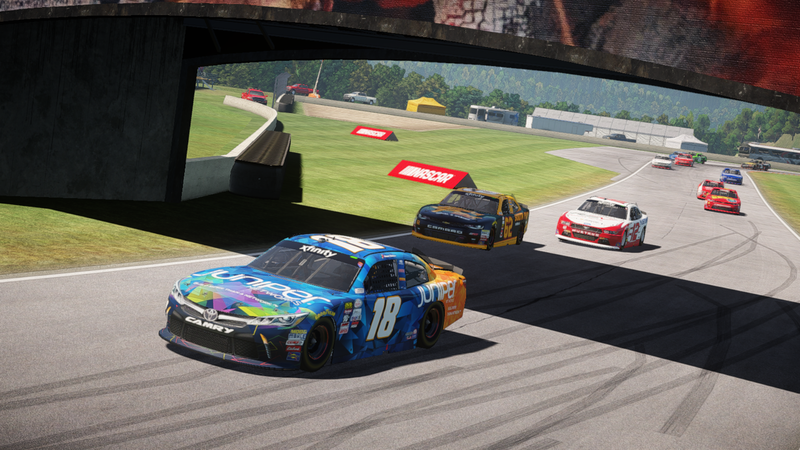 All of the race length options, pit stops, caution flags, penalties, and other things to make a race feel like the real deal are present and accounted for as well and you can adjust or turn them off entirely to your liking. Career mode has you starting out as a hot seat driver in Trucks and racing on single race contracts for any team that needs you. By performing well you’ll get better offers in better trucks and will eventually earn a full time ride for the next season. Then you do the same thing to earn an XFINITY full time ride. Then once again for the Monster Energy Cup Series. While this all sounds like a good idea – moving up through the ranks until you reach the top - the execution is pretty poor because it takes dozens of races and hours upon hours of gameplay. You can’t skip or sim races, and you have to accept every hot seat contract, so you spend a ridiculous amount of time running in Trucks and XFINITY before you even sniff the Cup series. Running in more than one series at once also means you’ll often do races on the same track back to back, which is boring. Well, maybe if you’re Kyle Busch you don’t think it’s boring. But in this game it’s pretty boring. I’m not saying I don’t like the career, but simple options to just simulate and skip races would make a world of difference. One major improvement over last year’s game is that you don’t have to waste a lot of time in a ride that is totally incapable of winning. In fact, you get in pretty decent hot seat rides and can actually win almost right away. On the flip side, though, there is little sense of progression this time other than moving up to a new series every year. You win money but its totally pointless and you can’t actually do anything with it. Overall I’d definitely say the career is better in Heat 2 than it was in Heat Evolution, but they just sort of replaced one grind – building a team from the ground up - with another – running lower series with slower teams - here. I was pretty hard on the gameplay in my review of NASCAR Heat Evolution last year, but I did actually eventually sort of grow to like it as I continued playing after the review was posted. It was basically bumper cars and you were either glued to the track or constantly wrecking loose, depending on what physics mode you chose, but it was a surprising amount of fun once you just sort of turned you mind off and got to racing. Not much has changed in NASCAR Heat 2, as far as I can tell, but I have enjoyed my time with it overall. The crash physics are still inconsistent as heck and you never know when ramming full speed in the back of someone will have zero effect or a low speed love tap will send them spinning wildly, but your best bet is to just not run into folks anyway. The addition of driver rivalries and A.I. that actually remembers how hard you race them – and will seek revenge if you race them too roughly – is very cool, though and actually does seem to work fairly realistically. One other thing I want to say about the gameplay, and I said this last year too, is that racing in traffic feels so freaking good in these games. 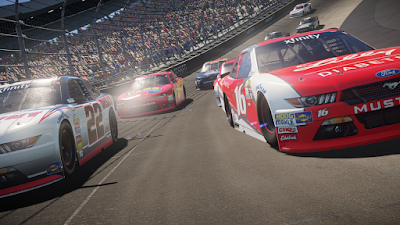 Certainly no other NASCAR games, and few other racing games, make you feel as comfortable when racing door-to-door inches away from other cars as you do here. Yeah, it has wonky physics and is basically bumper cars, but it is fun. Driving through the field from the back to the front is a thrill. Drafting actually works at almost all tracks, not just Daytona and Talladega. NASCAR Heat 2 can be a heck of a lot of fun to play. There are still a surprising amount of flaws and nitpicks, though, that drag NASCAR Heat 2 down a bit. There are still only three camera angles – in-car, hood, and behind in third-person – and I would have liked more options so you can see better. You still can’t move the camera around during a race, or even look behind you, which is absolutely baffling. There is a replay feature this year, but you can only look at your car rather than moving through the field freely. I also have to say that while the addition of the Eldora dirt track is cool, sliding around on the dirt doesn’t really work that well with the physics here. In my races none of the A.I. ever actually slid or got sideways, though I definitely did, so the races at Eldora were sort of bland and boring. NASCAR Heat Evolution was pretty bare bones when it came to the presentation so it is nice to see that NASCAR Heat 2 got a complete overhaul. Most notably is that the menus are much more attractive and have race footage playing on them. It actually looks like a real game and not just stock menus pasted in, at least. Out on the track the game looks a bit better too thanks to an improved lighting engine. It still has a kind of dull and flat look compared to, say, Forza, but it is decent enough looking. And night races can actually look quite stunning. I didn’t have as many framerate issues as I did last year but in longer races it does start to stutter more severely the longer you go. Sound wise the game is solid with a soundtrack of inoffensive rock greeting you on the menus while during races all you hear is the roar of the engines and comments from your spotter. I dearly hope they try to give the game more of a TV-style presentation in future iterations, though. Give us TV graphics and real announcers and stuff to make the events not feel so generic, please. All in all, NASCAR Heat 2 is a pretty massive improvement over NASCAR Heat Evolution but Monster Games still has some work to do. Fixing up the career, tweaking the gameplay so it isn’t just bumper cars, and continuing to improve the presentation will have NASCAR Heat 3 in fine shape a year from now. What are NASCAR fans to do in the meantime? Well, NASCAR Heat 2 is, as I said, pretty big upgrade of Heat Evolution. It still isn’t up to the Eutechnyx games in terms of gameplay, but they’re making great strides almost everywhere else to the point that I’m comfortable giving NASCAR Heat 2 a recommendation with some caveats. Buy it for the splitscreen and having all three national series, but don’t expect too much from the gameplay.